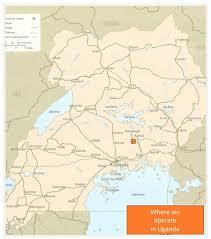 The area where our charity operates is in SE Uganda, East of Kampala and then north of Jinja and just south of Kamuli. BSUF has its own office in Kamuli. Butansi village and Butansi subcounty is off the Jinja-Kamuli main road. It has a few retail shops, with no running water or electricity. Kamuli is the nearest town. The main activity in the area is subsistence farming. Crops grown include bananas, maize, groundnuts and coffee. The output from the crops depends on the ever-changing seasons. Some animals like pigs, goats, cows and poultry are reared. The inhabitants of Butansi Village, like many other people in this region of the world, have to face numerous problems. The most serious of them are HIV-AIDS, malaria and recently water contamination which has severe, and if untreated, lethal consequences. Many of the children are raised by a single parent, or grandparent. Life is hard and it is difficult for them to get a proper education.